Base: Even though there's still some time for the poll to end and how not many people have voted...I've decided we'll be using Corra. Background: A studio photo shoot, "blank" background with some cameras. If anyone's willing to help with/do the background, it'll be much appreciated. Who doesn't love to doll something pretty every once in a while? 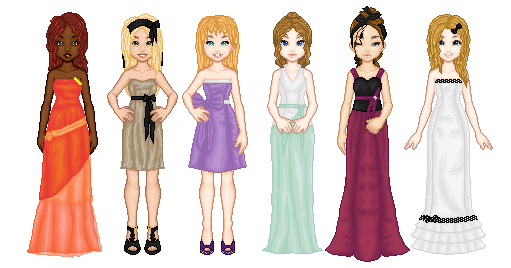 For this collab, you'll chose 1-2 dresses from the dress site, any color, and just make a coll with it, that simple. It doesn't need to be your or any character of yours, so you can be as cutesy or random as you want. * If the dress you chose comes in a different color than it shows and you want to do that color, go for it! Use that creativity! * And absolutely no frankendolling. Last edited by Vanity~Sweet on Sun Oct 17, 2010 7:39 pm, edited 2 times in total. Click the images for the shop links! I would like to join please. I've already picked out three that I'd love to make, hope that's ok.. cause I really can't choose between the last ones. Sure you can do three Mai. And those are some really great dresses you chose. ...Did this collab just die. ?